The International Monetary Fund welcomed the devaluation of the yuan on Tuesday, saying it will allow market forces to play a greater role. 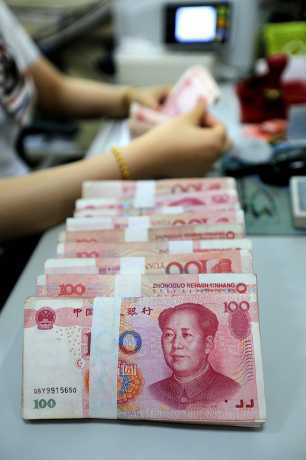 Once again today, the yuan was fixed on the weaker side by the People’s Bank of China, the central bank. The daily midpoint reference was set at 6.3306 against the US dollar, weaker than the exchange rate previous day. The yuan was set at 1.6 percent lower in the morning. Today’s depreciation raised further fears that the currency could fall further. The IMF said: “The new mechanism for determining the central parity of the renminbi announced by the PBoC [People's Bank of China] appears a welcome step as it should allow market forces to have a greater role in determining the exchange rate. An IMF statement said China should achieve a floating exchange rate within two to three years. Ma Jun, chief economist at the PBoC research bureau, attributed the lower rate to a long-standing gap between the central parity rate and the previous day's closing rate on the inter-bank market. In a latest statement today, the central bank said the rate changes are normal, as it shows a more market-based system and the decisive role that the supply-demand relationship plays in determining the exchange rate. “This may lead to potentially significant fluctuations in the short run but after a short period of adaptation the intra-day exchange rate movements and resulting central parity fluctuations will converge to a reasonably stable zone," the PBoC said. Ma also said the shift is a one-off technical correction and should not be interpreted as an indicator of future depreciation.